The Australian actress who became one of London's most famous suffragists. In 1909, a young Australian actress made headlines around the world when she took to the sky over London in an airship emblazoned with the slogan 'Votes for Women' and dropped leaflets over the city. Muriel Matters was dubbed 'that daring Australian girl', and the American media declared it to be the world's first aerial protest. Just months earlier, Muriel had become the first woman to make a speech in the British House of Commons, after chaining herself to a brass grille to protest against the segregation of women in the Parliament. She went on to become one of the most famous suffragists of her day, her skill as an orator drawing crowds in their thousands. So why is the remarkable Muriel Matters a relative unknown in both Britain and her home country? 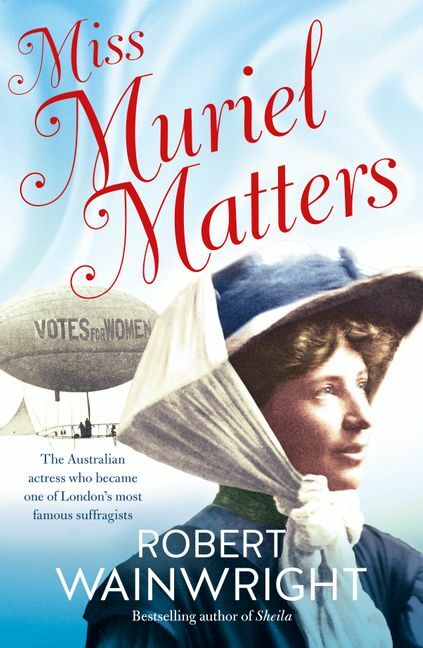 In Miss Muriel Matters, bestselling writer Robert Wainwright discovers an extraordinary woman full of intelligence, passion and bravery who fought for women's rights in a world far from equal. Robert Wainwright is a well-known journalist and the author of several topical books. Fascinated by characters and what drives them, he has written books about Rose Porteous, Caroline Byrne, Martin Bryant, Sheila Chisholm, George Ingle Finch and Ian Thorpe. The author of the bestselling Sheila: the Australian beauty who bewitched British society, he lives in London with his wife, Paola Totaro, and their family.